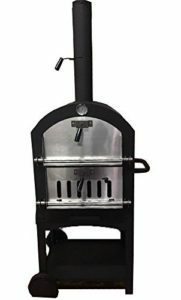 For a pizza oven which delivers optimum results without a steep price tag, then this Super Grills model is ideal. Maybe you don’t cook pizzas all the time, but want the choice when you fancy one? Or perhaps you just don’t want a clay oven which will take up a lot of space in your outdoor area? This pizza oven is compact, durable and easy to move around thanks to the two wheels. So, you can handily position it to avoid the wind, smoke blowing over everybody sitting outside or simply roll it into storage once you’re done. Even though it’s primary function is to cook the perfect pizza, you can also bake bread and prepare steaks, chicken, pasta dishes and barbecue-based foods well. Simply control the temperature by using the correct amount of lump wood charcoal briquettes and monitoring the air flow. With an added temperature gauge built-in, you can keep an eye on the heat without having to open the door and use your own thermostat, making it easier to adjust, ready for the next food item. A dedicated ash tray takes a lot of effort out of cleaning as it collects most of what would otherwise need to be scraped out and brushed away, so there’s no need to avoid using it just to avoid having to clean it afterwards. 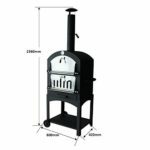 Due to its standard shape, most pizza oven covers will comfortably fit over it if they are within the correct diameters. It is easy to assemble, and there is a 12” pizza stone included so you can get going as soon as it arrives. Restaurant quality pizza without even having to leave the garden.